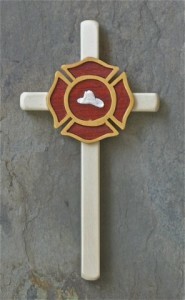 This cross honors the service of this group of first responders whose sacrifice is remembered in prayer and devotion. In designing this cross, I wanted to use special materials. The helmet is made of mammoth tusk, carved by Jim Lorette. 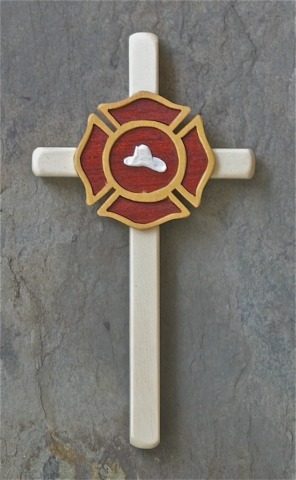 Based on the design of the Maltese Cross, the firefighter insignia is made using a modified marquetry technique so that the small red pieces (Satine wood) fit exactly into the yellow outline (Pau amarello wood). The insignia is set into an ‘oversized’ cross made of Holly, a wood associated with prayer. A person’s name can be written on the back.